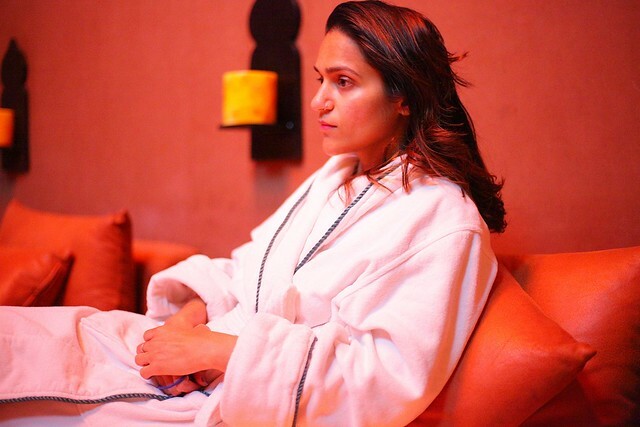 I sit and write this post on a chilly winter morning in D.C. How I wish I was back at Palais Aziza Resort and Spa ad getting pampered at their luxurious and relaxing spa facility. Back in December, we made our way from Madrid to Marrakech, Morocco to dive into their glorious culture. One of the things I wanted to experience was Hammam. I made a couple's appointment for the afternoon and we were ready to unwind from our long travels. We were greeted with their warm and friendly staff who made us feel comfortable instantly. 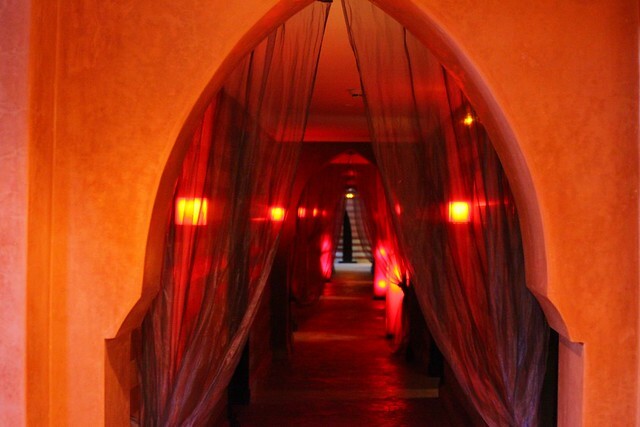 This was our first time trying Hammam so we were not sure what to expect. This is the hammam room. It was dark and misty due to the steam. Post spa relaxation area. I could spend the whole day here! 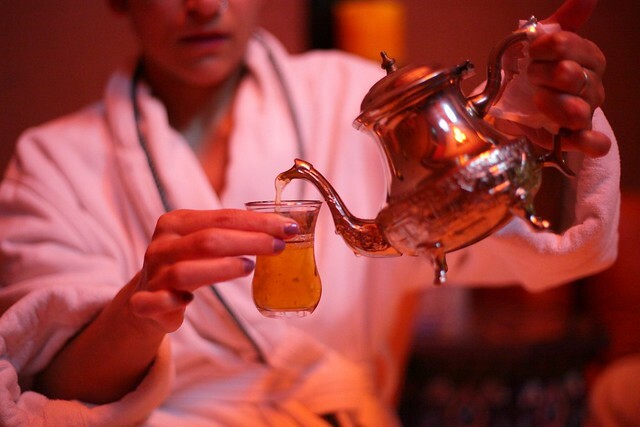 They provide you with never ending flow of Moroccan Tea (Mint Tea). I am addicted to Moroccan Tea (Mint Tea). It has become part of my daily routine now. Relaxed. Rejuvenated. And ready to move-in. 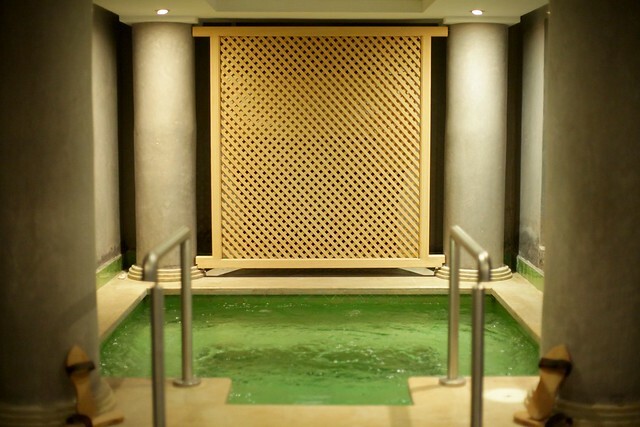 A Hammam is a steam room, similar to a Turkish bath, where Moroccans habitually go each week to cleanse themselves. This is a rather important part of their culture. Men, women and children often spend hours once a week, catching up with each other. After this long ritual of bathing, and cleansing your skin literally glows (see last photo). 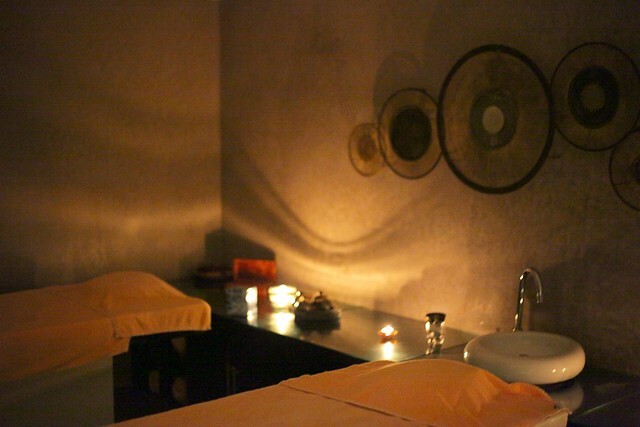 Once we entered the Hammam room, we laid on our mats face down. Then the Hammam lady came and dipped a metal bowl in a pool of warm water and sloshed it all over our body, generously, alternating between me and my husband. 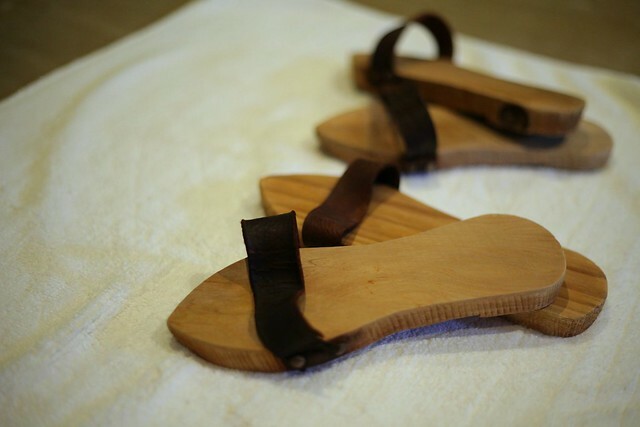 She then followed it with rubbing black soap (scrub) on every inch of our bodies vigorously. Once the soap was washed off, she applied a layer of clay all over our body and face. After 5-7 minutes, she asked us to stand naked (yes!) and another round of water was sloshed all over to get the clay off. And then we were wrapped in to our robes and made our way to the relaxing area. There we were treated to some Moroccan tea, which I sipped while genuinely pondering, "Why isn't this my every day life?" 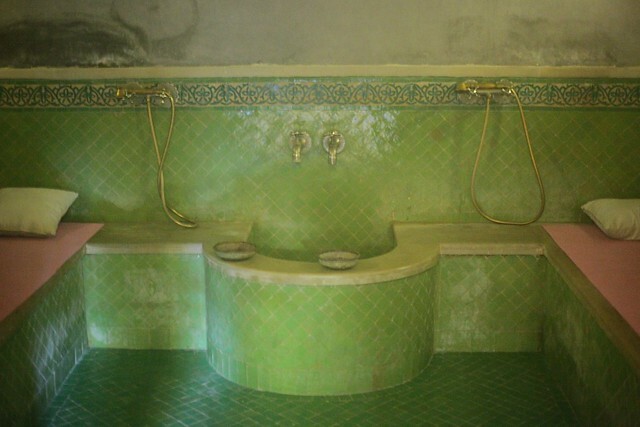 Traditional Moroccan Hammam was hand's down, one of my favorite experiences of all times. 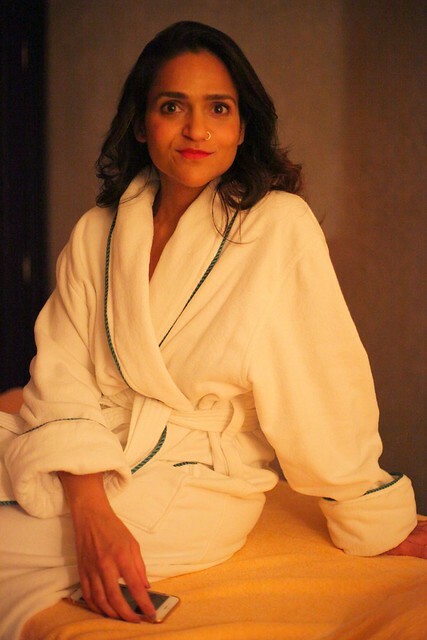 The whole ritual of cleansing the body with scrub, and body mask was out of this world. I cannot wait to return to Palais Aziza Resort and Spa to relive this again (and if I could I would move in). Who doesn't want to be pampered and spoilt like this every day. Am I right? 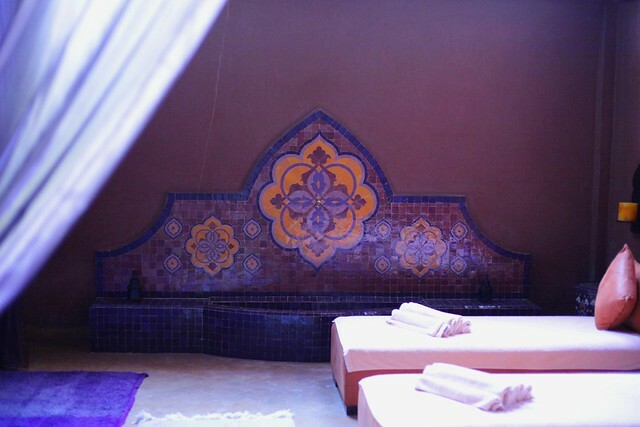 If you are planning to visit Marrakesh definitely add the Traditional Moroccan Hammam at Palais Aziza Resort and Spa to your list. It truly is a must! WOW! I would love to go this place.looks fab! Wow! The place looks amazing. It must have been so soothing to sit in the jacuzzi for hours and sipping on that mint tea. Hope I can go there soon! This place looks so soothing!